The weekend was an absolute blast. There are so many automotive events that happened this weekend. I’m really going to share the events I attended and make a brief comment on a topic of great relevancy at the current time. First up, Friday evening I went with my dad over to the Ashtabula county fair in Jefferson Ohio. My grandparents live near there and I’ve heard so many things about the how great the demo derby is at the fair. Well, in my opinion, it was interesting, not quite like other derby’s I have been to. It was a patience game and very slow, strategic, and inconsistent. With that said it was very interesting to experience a different way of doing things, although it was not exactly the best way. I did enjoy the time and experience I had with my dad and uncle who accompanied us. On an entertainment scale of 1 to 10, 10 being the best, I give it a 6. It receives a “passing” grade mostly for the different way of hosting the derby. Next up, Saturday evening, I called an audible and instead of going dancing, My dad and I stopped on our way home in Norwalk Ohio at Summit Motor Sports Park for the Night Under Fire. Best decision ever. I absolutely love drag racing. Four funny cars, two top fuels, gassers, top fuel bikes, four jet cars, and one jet semi….made for such an epic evening. And top it all off with a $100,000 fireworks show, it was just incredible. But it still didn’t stop there. After all the racing we got to go down and see the cars and meet the drivers on the track! I was so super pumped because I had never been on the track. But it still keeps going BECAUSE…remember I said two top fuels? 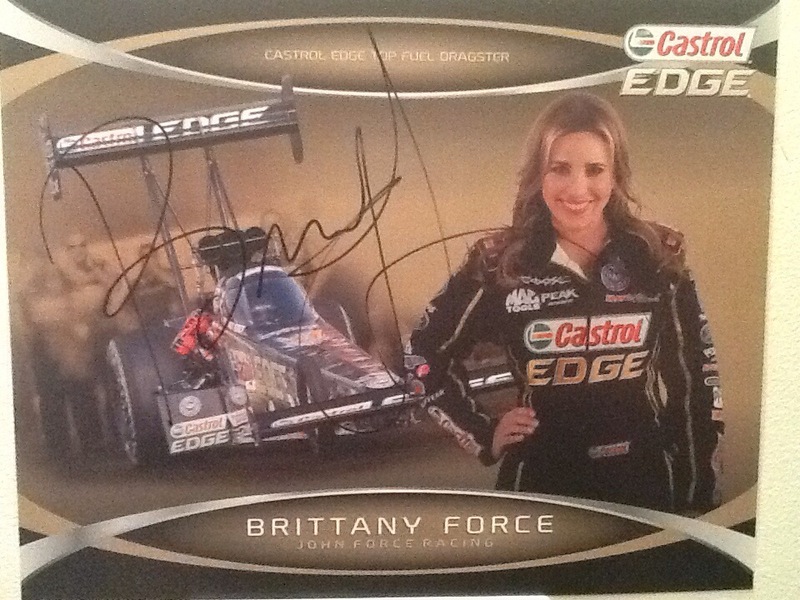 Well, one of those just happened to be the lovely, talented, and fastest girl in motor sports, Brittany Force! I GOT HER AUTOGRAPH! I was very happy. I still am. It all accumulated to one epic experience. Summit Motor Sports Park knows how to put on a SHOW! A legit, fun, safe, involved, entertaining show! I give it a 10 with all the accolades possible! Sheer happy epicness! I walked out of there with the biggest smile ever! So that’s pretty hard to top. Almost impossible. Which, I will say right up front, the car show I went to on Sunday afternoon did not beat Saturday evening. I give Sundays car show in my little town of Tiffin, an 8. It is hosted by the Amvets and they have really great music, food, prizes, and of course cars. Lots of them for such a little town. I wandered around by myself just enjoying being in the classic, stereotypical car show atmosphere. I had been to the same show two years ago and that was great then as well. I was very pleased to see that it was still going strong, even after I missed a year. So that was my incredible automotive weekend. To just comment on the tragic incident regarding Tony Stewart and Kevin Ward Jr. It is very sad that a life has been lost in the motor sports realm. The magnitude of this event is going to impact aspects of the sport in all levels. I believe Kevin did not make a wise choice by getting out of his car. I believe that Tony should reflect on all the events of his recent years on dirt and evaluate what he should do moving forward. It is saddening to see the effects of impulsive decisions, no matter acted upon or spoken, this has caused a great ripple. I am praying for healing and wisdom. Now that I have gotten all that out, hopefully I will be able to get back to blogging more and sharing all things automotive. My goal is to go to the Woodward Dream Cruise this weekend. I will hopefully have plenty to say about that and am looking forward to sharing. Thank you so much for reading. Posted on August 11, 2014 August 11, 2014 by bmfullerPosted in UncategorizedTagged Automotive, car show, cars, classic cars, drag racing, funny car, kevin ward jr., motor sports, NASCAR, norwalk, racing, sports, tony stewart, top fuel.